Here’s a fun way for kids to create their own custom bookmarks while we (shhh) sneak a little learning into the mix. Children use the included grid letters of the alphabet to copy their initials onto a .25 inch (approximate) gridded bookmark template. They then decorate the remaining bookmark squares however they choose. I’ve included an extra page of bookmark templates, just in case the kids want to make more for their friends. Personalized bookmarks also make meaningful (and useful) DIY gifts for Mom and Dad. Want to extend the activity? Grab a piece of graph paper and have your child/student write a message, or their full name, or simply copy the alphabet. For more advanced critical thinking, ask students to double the size of each letter. These are just a few ideas. I’m sure you’ll think of more. 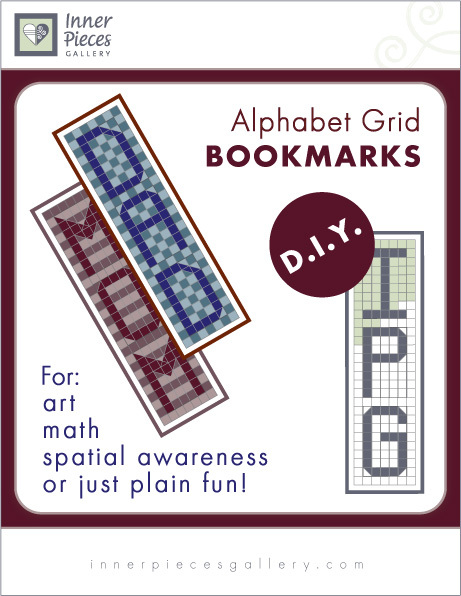 Grab these Alphabet Grid Bookmarks DIY – Free in my Teachers Pay Teachers store. You don’t have to be a teacher to sign up, so if you haven’t already, please do! You’ll find plenty more TPT freebies all across the site.